As you can see, we have a new addition to our fur family! 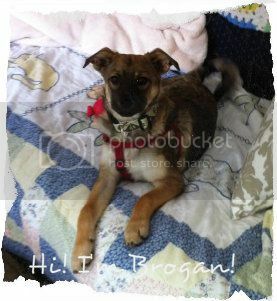 His name is Brogan and he’s about 5 months old. Part Norwegian Elkhound and part beagle (interesting mix! ), he’s full of LOVE! and JOY! and YEY! and LIFE! It’s been so long since we’ve had a puppy – gosh, Max was 16 so at least that long ago and he came fully trained. So, this is something new for us. Yesterday was an adventure – we have an in-ground pool covered by a big tarp during the fall/winter/early spring. Brogan got so wound up playing with neighbor dog Lily that he just bounded right onto the tarp! He was (almost quite literally) walking on water! And happy as a clam about it, too! Neighbor Greg and I (tried to) remain(ed) calm as we called him to come out. As soon as we got him out, he just ran right back on it! Such a happy little dork! We suspect he better get swimming lessons or risk being on a leash outside all the time. As much sadness as I had around losing my beloved Max is how much joy Brogan brings with him. He cuddles up next to me in bed (much to 20 year old LucieCat’s dismay since that is HER SPOT, thankyouverymuch! ), gives me kisses a’plenty and is just so darn happy all the time. It’s really nice to have this energy in the house. I know he won’t always be like this (and yey! because I’m frickin’ exhausted!) but for now, it’s really helped me shift my energy, get me out and around more and helped lessen the pain of losing Max. Wonderful, wonderful description. Your voice is so strong and….FUN. Yay, indeed! Yep, this. You and I went through losing our dogs at almost the exact same time and welcoming puppy love & energy at the same time, too. You took the words right out of my mouth (and heart!). Enjoy Brogan, Lisa! I only wish we lived closer for puppy play dates! So cute!!! I love dogs…ever since I was a little kid, I thought that they were like angels.